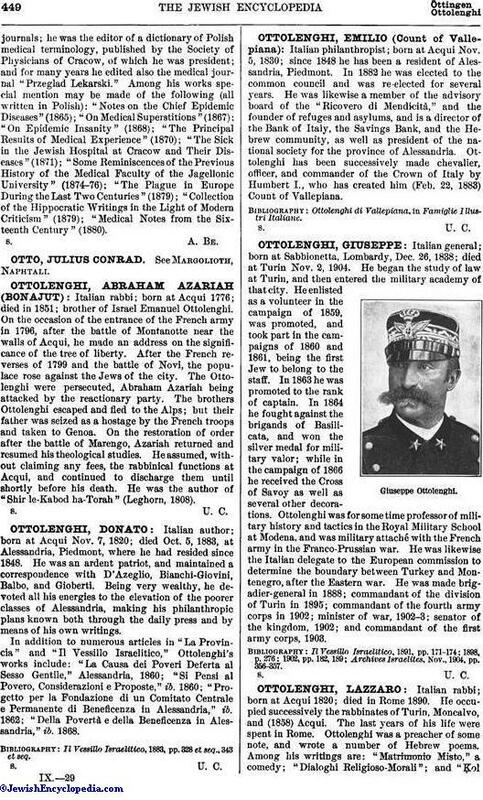 Italian rabbi; born at Acqui 1776; died in 1851; brother of Israel Emanuel Ottolenghi. On the occasion of the entrance of the French army in 1796, after the battle of Montanotte near the walls of Acqui, he made an address on the significance of the tree of liberty. After the French reverses of 1799 and the battle of Novi, the populace rose against the Jews of the city. The Ottolenghi were persecuted, Abraham Azariah being attacked by the reactionary party. The brothers Ottolenghi escaped and fled to the Alps; but their father was seized as a hostage by the French troops and taken to Genoa. On the restoration of order after the battle of Marengo, Azariah returned and resumed his theological studies. He assumed, without claiming any fees, the rabbinical functions at Acqui, and continued to discharge them until shortly before his death. He was the author of "Shir le-Kabod ha-Torah" (Leghorn, 1808).